When it comes to reach and wash cleaning techniques in the Newcastle area, Tyneside Window Cleaning Co are the experts you need to call. With many years of experience using tried and tested techniques, you can rely on our team to provide the window cleaning results you are looking for. The warm water removes stubborn dirt, dries quicker than cold and also leaves a luxury shiny finish that all windows in Newcastle deserve. We feed hot water through our systems to the soft brushes on our extendable poles of up to 60ft. Doing this allows us to avoid using ladders and chemicals for a natural and safe window cleaning solution. 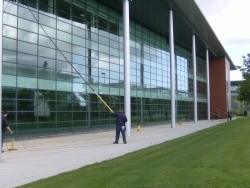 Tyneside Window Cleaning Co hold an enviable reputation in the cleaning industry and have worked with various properties throughout the Newcastle. Some of the commercial properties we have worked on include the prestigious Beaverbrooks jewellers and even Greggs, the famous pasty kings. With our experience in the industry and dedication to our customers, you are guaranteed the high level of cleaning you expect when working with professionals. Call our team on 01912 529 563 to find out how you can make use of our reach and wash cleaning system in Newcastle.